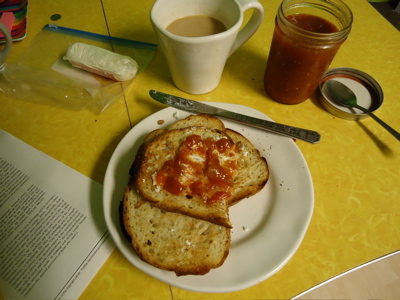 Friday morning, tomato jam and goat cheese on toast. This was exactly what I needed to start the last day of the (school) week. The jam is very sweet at first, and then the flavors smooth out a bit and there is a nice kick (from the chili flakes) at the end of a bite. I was concerned about the consistency of the jam — seemed a bit loose to me — but this was well within the range of the jam category, though I spread it with a spoon instead of a knife. I’ve been reading a bunch of food blogs that focus on preserving, and I’ve seen some discussion about how flavors mellow and meld as canned food sits on the shelf. Or in the fridge. This makes sense — the last jar of my summer 2009 dilly beans were different than the earlier jars. And some meals that are just alright as dinner are incredible as leftovers. So I like this! 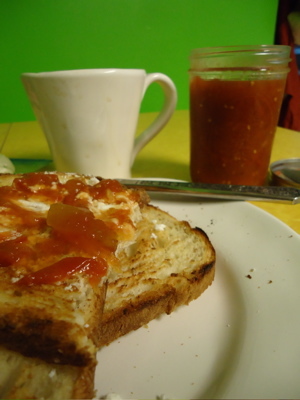 It appeals to my love of savory breakfast food, and I’m interested to see if the flavors in this jam mellow over the next few weeks (for the jar in the fridge) and months (for the jars stacked on the shelf). My next plan is to slather this stuff on grilled cheese, and to think about using it as a sweet/spicy homemade alternative to ketchup (and someday, I’ll try my hand at making my own ketchup!). 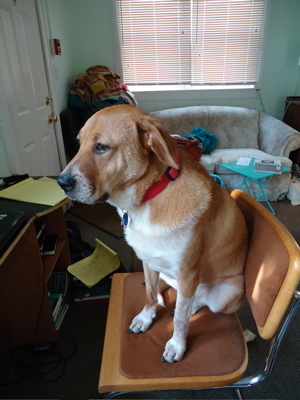 Speaking of silliness, somehow the boy managed to get Boh perched on a chair. And then Boh serenely gazed out the window. On Friday night, after a long week, we curled up and watched a movie, which meant that I finally picked up my idlewood. 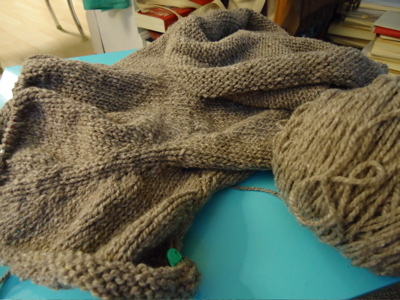 I am super close to separating the sleeves from the yoke. And I am super excited about this sweater. This entry was posted in CSA veggies, kitchen, knitting and tagged boh, cowl, CSA veggies, idlewood, knitting, sweater, toast, tomato jam, tomatoes by barefootrooster. Bookmark the permalink. I literally started to salivate when you suggested your tomato jam on grilled cheese–that sounds AMAZING. And few things are better than goat cheese…;-) Your Idlewood is progressing so quickly, looks great! Your Idlewood looks great! I wanted to make some tomatoe chutney this year but the tomatoes at my parent’s just stayed green. Too much rain this year – they’re swamped with beans instead. Yay for kitchen adventures! 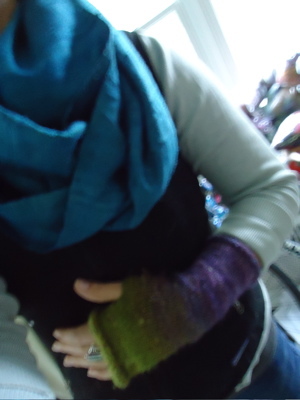 I’m soooo jealous that you’ve had chilly mornings requires handknits. Will fall never find Nashville?! That jam looks delicious … as does Idlewood! Once you separate the sleeves from the body, I find it flies! Breakfast looks yummy, arm toast looks great, and Boh, oh Boh, such a wise sage. 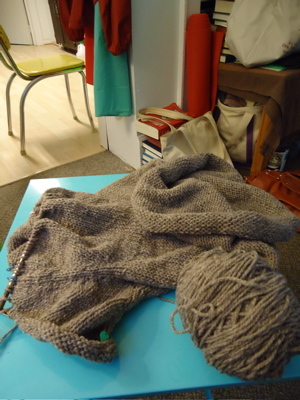 Good luck with the sweater; I’m picking my mondo cable pullover back up to finish the sleeves, hopefully in time for Rhinebeck! !